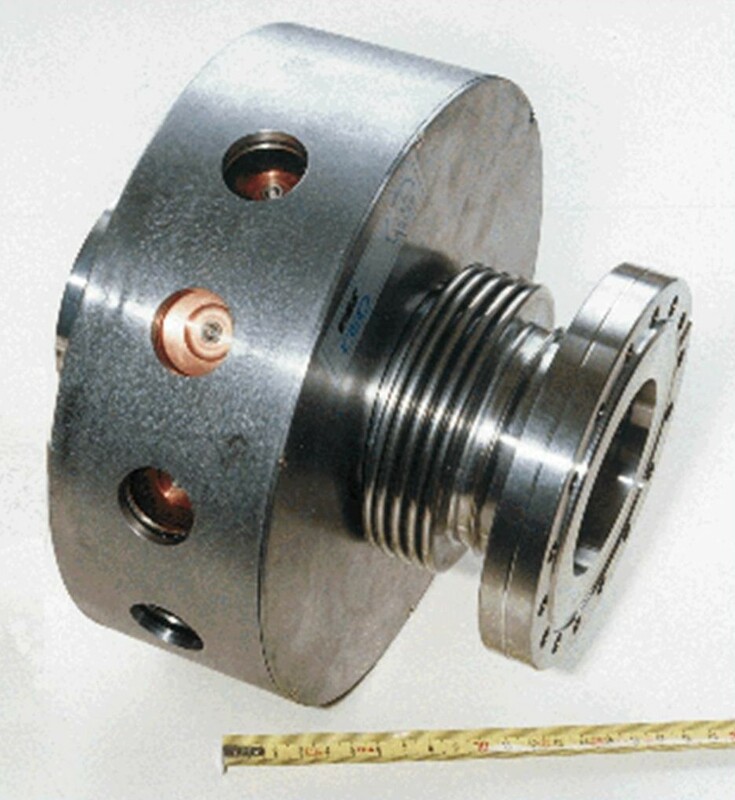 Development of the instrumentation and radio frequency components (RF) covers everything that concerns RF supply, beam measurements (beam position monitor, beam profile monitors…), tuning rings, as well as the design and incorporation of the cavity fittings, such as the couplers that inject the radio frequency wave and the cold tuning systems. At the same time it must make allowance for environmental constraints (i.e. radio frequency, heat and radiation). An RF power supply test bench, with continuous feed of 704 MHz and 80 kW, is in the process of being installed at Saclay. It will be used to test the components on the Cryholab test station. The power amplifier is a grid tube IOT (inductive output tube). It is the most powerful at present on the market, and has been specifically developed for use on accelerators. Electrical supply of 40 kV running at 4 A is in place. It also has auxiliary supply for heat and polarisation, as well as for the focuser. A 500 W transistor preamplifier controls IOT input. A safety slide valve (arc detection, focusing error, etc) has been installed but not yet tested. The wave-guide IOT output is connected to a water-cooled coaxial load via an ad hoc jump. The circulator and the short circuit have been received but not yet installed. The sliding short circuit control software has been reworked so it can support Labview©. The LEP items lent by CERN to test the Iphi radio frequency quadrupole are under installation in the old Saturne hall at Saclay. The 100 kV-40 A supply needed for the two klystrons is being hooked up. 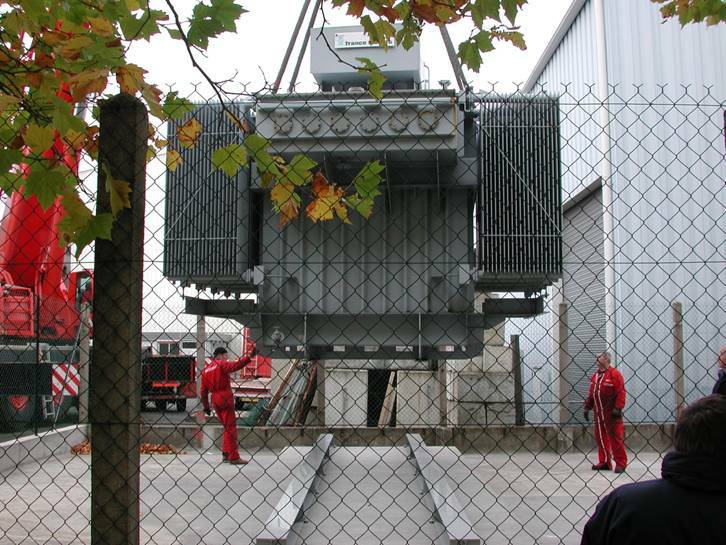 The voltage-reducing transformer has been rewound to match the 15 kV system of the Saclay centre. The study of the interface needed for controlling the CERN supply using the Iphi command/control system has been completed. Low-level electronics use signal processing and control techniques specific to the operation of accelerator sub-assemblies. These are accelerator cavities, the beam position monitor (BPM), machine protection systems, etc. Acceleration of bunches of particles in an RF cavity requires amplitude and RF wave phase feedback. A digitally based system has been studied and proposed for the Soleil and Spiral 2 projects. It can deliver a level of flexibility, integration and reliability greater than that of previous analogical systems and at lower cost. As part of the TTF installation SACM provided high resolution (10 µm) BPMs complete with electronics, fitted on the outside as well as the inside of the cryomodules. The beam diagnostics also include fast electronic current measurement for machine protection against beam loss. In pulse mode, superconducting cavities operating at high accelerating gradient undergo mechanical deformation due to Laplace forces, which modifies their resonating frequency. Traditional amplitude and phase feedback needs considerable RF power, since part of the incident power is reflected. A complementary system of piezoelectric bars can counterbalance this effect by applying opposing deformation, but first of all we need to work out the voltage profile that is to be applied over the whole of the RF pulse. In actual fact the linkage between the mechanical characteristics and the variations in radio frequency field result in complex behaviour that must be modelled for each cavity on the basis of their individual experimental data. We have developed this model, as well as a simulation tool to predict the performance and limitations of such a system based on its RF characteristics and the mechanics of its cavities.